Incredibly quiet and powerful CPU cooler that costs $8 less than the ITX Noctua cooler I was eyeing. I've used only SSDs on my computers for the last 5 years and I simply cannot go back to legacy HDDs. This was the cheapest SSD I found at the time. Although 240GB might not seem like much, the speed trade off is worth it for me. Windows boots in a few seconds and any application loads instantly. I am more than impressed with this card. I was considering spending $30 more and going for the MSI RX 480 but I wanted this ITX build to be as cheap as possible. I chose AMD for its price/performance ratio, to use FreeSync on my monitor, and because I dislike Nvidia's business practices. The MSI RX 470 4GB Gaming X undervolts like a champ and becomes much more efficient using stock frequencies, greatly reducing the required fan speed to maintain 70C under 100% load. I'm using 2000 RPM as target fan speed and the temperature remains stable at 70C. At stock settings without undervolting, I had to use 2400 RPM to maintain the same temperature. This GPU is silent when idle and fans only start spinning at 60C. Because of the small case and the lack of case fans in the GPU chamber, I find the ~58-59C idle temperatures to be higher than I want them to be, sometimes forcing the fans to come on and off repeatedly. I plan on installing two static pressure fans in the GPU chamber to improve idle/load temperatures and play around with overclocking. Overall, this is a quiet, powerful, and so far an undervolting beast of a GPU that runs all games I've thrown at it at very high frame rates. Hard to believe I can get this performance for $157. If I had used the MIR, the total cost would've been $137. I love this case. This is my first PC build and I knew I wanted to build an ITX rig. It took me some time to figure out how to manage the cables correctly and remove the small triangular support in the GPU chamber that wasn't allowing me to install my GPU. Once I figured everything out I can say this case fit my needs perfectly. Though I feel that it is maybe $20 more expensive than it should be. One thing I disliked was the PSU that came with it. It is much noisier than expected. While my CPU and GPU fans are inaudible when system is idle, the PSU makes an audible buzz that drives me a little crazy. Even though the Node 202 + PSU combo did save me some money and build time, if I had to get the parts again I would get the case and PSU separately and put more money into a quieter PSU. Cashew trees produce both a fruit ("apple") and a nut, and a valuable oil can be drawn from the nut shell. After the cashew flower blooms, a nut forms. The apple later swells between the nut shell and the stem. It takes two months for the cashew apple to ripen. When harvested, the apple can only keep for twenty-four hours before it begins to ferment. Although the fruit can be used for making many typical fruit products (jellies, jams, juice, wine and liquor), the apple is often discarded, in pursuit of the nut. If processed and stored properly, the cashew nut can be kept for a year or longer. Technically, the actual nut is the thick-shelled seed. The outer shell (coat) of the seed contains the poison oak allergen urushiol, and may cause dermatitis in hypersensitive people. Most educational thing I've read all day. The CPU was such a great choice. The G4560 is only and proven to be 5% less capable than the i3 6100. What's crazy is that 5% even fluctuates, its not even an across the board thing. I honestly wouldn't be surprised to see Intel make i3's obsolete and just make these their entry level CPU's. Because they've obviously been received well. Hard to overstate how impressive the $60 G4560 is. If Ryzen is as sucessful as it's looking to be, Intel will be forced to reinvent itself completely. Either way, a big Intel price cut will be great for consumers but will still ultimately leave a bad taste in consumers' mouths, basically proving their abusive pricing practices. I also wonder how good and how aggressively priced AMD's APUs will be later this year. They might bring the G4560 some serious competition. But as of right now the G4560 is clearly the budget king. I think AMD wins this year if one of the new Ryzen chips is a quad-core cpu with 2 hyper threaded cores for about 75-80 bucks. That would be an absolute steal for what's essentially a six core processor. $129 USD for a quad-core without SMT. Probably still going to be a very good performing CPU as it is the same architecture as the higher-end Ryzen CPUs and clocks at 3.2/3.5ghz. Should have good single and multi-core performance even without hyper-threading. I'm sure at the price point it will annihilate the current Pentium lineup, and probably give almost all the i3 CPUs a run for their money. That mouse pad looks like it was used as a serving dish for powdered donuts. Both my mouse and mouse pad are stupidly old but still powering through their senility. Nice build in that case. Raw cashew nuts = best cashew nuts. Let's just say raw cashew nuts are my PSU. Don't you hate how mITX boards are so expensive yet you get less features, less potential and less physical materials? Zero logic behind the pricing. I like this combination. As soon as I saw HT on the new Pentium's I knew what was to come. RX 470 is also really good value. I think it has something to do with the manufacturing costs. You have to be more delicate when making a smaller case. But still, it is very expensive. Completely agree. I still have no idea why mITX boards are so expensive. They should be cheaper if they're smaller and with less features, not more expensive. The G4560 and the RX 470 feels like the best budget CPU/GPU combination available right now. This kind of performance for ~$200 can't be beat. Great build, pretty much my build I'm thinking of getting. Is it worth it to buy that motherboard and get the wifi but have to flash the BIOs? Or should I stick with a board that won't need to be flashed but I'd have to stick with an Ethernet cable? I like the WiFi on this mobo. Other than the terrible installation process, the end result is a very fast and reliable connection, especially when using a 5 GHz connection. 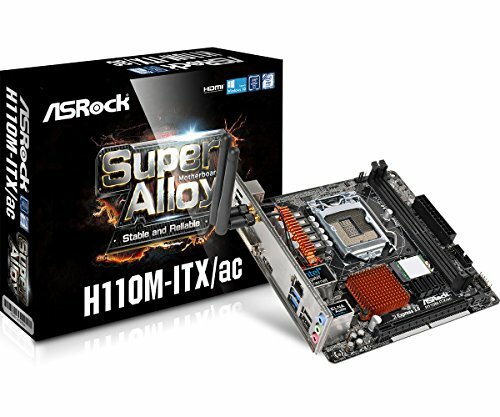 If you plan on using WiFi I suggest getting the same ASRock H110M-ITX/ac motherboard. It's the cheapest ITX motherboard for the LGA 1151 socket and not having to mess with a WFi adapter is worth it. If you plan on using Ethernet cable exclusively then just get the ASRock H110M-ITX and save yourself a few bucks. By now, I would assume that all ASRock H110M-ITX/ac motherboards should be updated with the P7.00 BIOS. ASRock released the update in October 2016. Places that go through their motherboard stocks quickly will most likely have them with the new BIOS. If you happen to get one with an old BIOS just buy the cheapest Skylake CPU, use it to flash your motherboard, and then return it. I bought one off of amazon because of their great return policy. Don't spend $20+ more on a 200 series motherboard. Good looking build man. I'd really like to do an ITX build for my next build. It would be super handy to have for LAN parties. I haven't found an answer for how the gpu connects to the mobo like that though. Is it an extension you have to run between the two? The Node 202 comes with a riser card. You connect the riser card to the motherboard then the GPU connects to the riser card from a separate chamber in the case. I think you'd really like the Node 202. If you have the time and money I suggest getting a better PSU than the one that comes bundled with it. Ok cool. And that looks like it fits most graphic card sizes too yeah? Was looking at picking up a gtx 770 for cheap locally and that thing is one long card. Thanks for the tips! GAME ON! Yes it should fit. Only the triple fan cards might be a little hard to fit in there. Remember to check the dimensions of the card before getting it. How much are you paying for a GTX 770? I haven't moved on one yet but the there's a Gigabyte GTX 770 for $80 locally. It's been on Craigslist for a couple weeks now so I could maybe get him down a bit. Also if nothing else I can always put in my older 750ti in. It'll do okay. Hey dude, did the mobo BIOS come updated? I had to buy a Skylake CPU, flash the BIOS, then return the CPU to Amazon. But this was a few months ago right when Kaby Lake CPU's came out. But right now I find it hard to believe that a place that goes through motherboard stocks quickly won't have ASRock's more recent P7.00 BIOS. The BIOS update is from October. That's about 5-6 months for the motherboard stock to be renewed. I suggest getting the 100 series mobo from somewhere like Amazon and saving some money. If you're unlucky and get an old BIOS, just buy any Skylake CPU, update the BIOS and then return it. I cleaned it up well and got a full refund in 3 business days. I'm still wondering why there aren't any budget ITX H210M motherboards yet. Does your motherboard have an HDMI port? 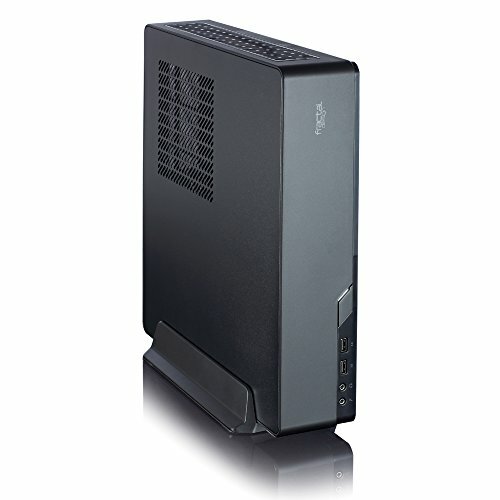 I comes with a 450w SFX PSU that is bronze rated and has short cables. A similar PSU is maybe $50 and the case is rather nice. As a combo it works well for the sale price of $110. Especially at the SFX format price point. The Kaby Lake's Pentium G4560 is not that far behind in performance of Skylake's i3-6100. It's the most ideal choice for tight budget processors these days to have hyperthreading from a dual-core processor and it's half the price of the i3-6100. G4560 vs i3-6100 UserBenchmark's performance results. When I saw these Pentiums available online, my price ratio was $60~$65 with no sales taxes. Though I do admit a lot of the processors sold like hotcakes. I got one for $63.84. Lastly, I do admit... It's awesome to have the first Pentium that has Hyperthreading. A lot of us geeks were dreaming to this day to become a reality to have such a Pentium. I remember some of us were wishing this when the G3258 was so popular for the overclock potentiality, but it hit a wall with some games because it had 2 cores and 2 threads. Now we have 2 cores and 4 threads thanks to the G4560 at such a low price. I think had the G3258 had hyper-threading, it would've been one of the best selling processors since its release date. I used one for my grandma's home/office PC and was thoroughly impressed with how it performed. Exactly. I was impressed with the G3258 too, with my Nephew's build. I wish I had grabbed the additional G3258 on Amazon that was also $49.99 but oh wells... It's still a great processor regardless, but I'm looking forward to building with the G4560 here, very soon. I wanna build with one so bad. I'm also super excited for Ryzen and what kind of competition that stirs up later this year. Hopefully you'll get to try the G4560 soon or someday. And likewise about Ryzen. if he said rx480 it would be good advice but that is BS.